That can be as easy as providing location and estimated time of arrival to shippers, said Karen Stetner, senior supply chain manager for Garick of Cleveland. Technology enables better ETA projections, even after a truck shipment is slowed, keeping the customer at the other end happy, Stetner told an audience of about 100 truckers, fleet managers and trucking officials. 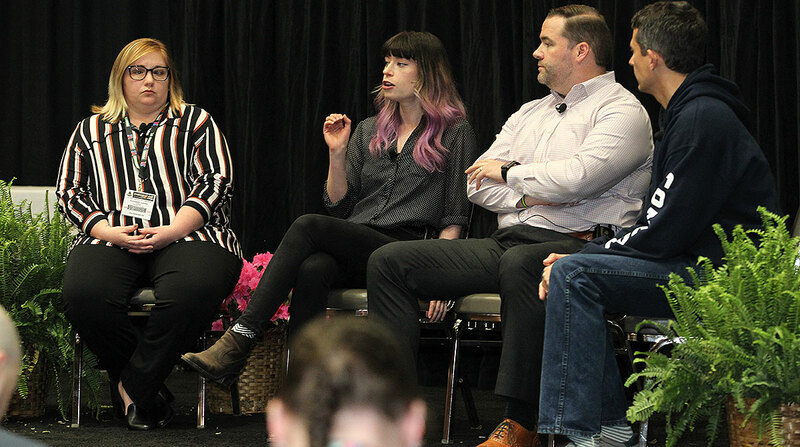 The panel, speaking here at “Inside the Mind of a Shipper” at the Kentucky Expo Center, consisted of representatives from companies that usually rely on small fleets or owner-operators. Stetner, whose seasonal company has as many as 200 employees to send out mulch to major retailers, said smaller fleets and owner-operators give Garick the best flexibility and they also are familiar with the company’s routes. “We find our best relationships are with the owner-operators or smaller companies,” Stetner said. The reliance on such smaller firms means cultivating relationships from both ends. Stetner said the ingredients for a successful long-term business relationship are respect and friendliness. Such relationships do not fray when capacity is tight and freight business is easier to come by, said John Reese, logistics and transportation director for Truco Enterprises of Carrollton, Texas. Truco, with 60 employees and a manufacturing partner, makes and distributes tortilla chips, salsa and queso dips, and counts Walmart and Sam’s Club as customers. The frequency of trips means Truco must know what carriers are thinking, so the company seeks feedback, Reese told the audience. One thing Truco decided from feedback was to cut down on “awkward mileage” for truckers and find better routes. One challenge for Garick is the seasonal nature of the mulch business. In freight, that means working with carriers on planning the loads to be spread out. “We cannot ship 80% of our loads in April, May and June,” Stetner said. Instead, the company worked out early delivery plans with truckers and major retailers, she said. Reese said feedback needs to be two ways to best understand key performance issues. Such two-way feedback helps Truco and its trucking partners avoid dwell time at a retailer. The audience peppered the panel, led by Convoy CEO Dan Lewis, with questions, including concern about decreasing rates and election-year nerves as the key 2020 presidential race approaches. Reese said uncertainty around election time does not usually affect his company as much as major national events such as national championship games. But he said rates can be affected by “comfortableness” around Election Day, as new federal transportation policies seem imminent. As for the U.S. economy, Reese sees it as good, but not at the same growth that he observed in 2018.